First, how to Authorize remote access? and how to fix this problem? The Authorize remote access is done where the RDS Server and QuickBooks is. The final step of setting up the RDS server is to make a connection to the QuickBooks company file. If the locate specified company mode is selected, the error is normally the company path is specified incorrectly. The location of the company file in the QODBC setup screen should be the full (local) path as it appears on the server itself, not as it appears on the remote computer. 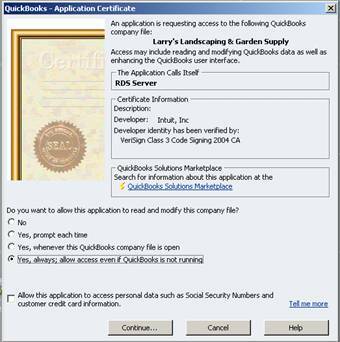 Basically, QODBC sends the path along to the server and the server uses that path to try and open QuickBooks. Also, QuickBooks has to be open with that company file in it the first time you access it from the Client. Thank you for your Thank you for your useful viodes! I wanted to ask you, I'm switching accountants now and also I want to save some of the fees that accountants charge by doing my own payroll and bookkeeping.I was wondering, my accountant for the first 6 months used probably accounts that I don't understand. Will it be a problem if I use different accounts for my bookkeeping for the rest of the year? With quickbooks the double entry is automatically done by the﻿ software? Where can I learn to do my Payroll?Thanks 0Was this answer helpful? Key in my case was : turning on QUICKBOOK FILE 1st and login as ADMIN , then start RDS server. then I could establish connection via RDS.